Our Special Correspondent Sundar's report on the Tamil Nadu Film Award Function. Everybody started pouring in by 4.00. 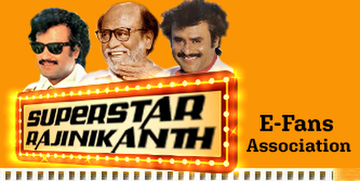 By 4.30pm almost all were present except Superstar. Our fans, why even the general public and industry people were seen with biting nail in a suspicion that whether Superstar would attend the event or not. Many actors arrived one by one. There was not much roar in the hall or claps or whistles for them when they entered. Why even for CM Kalaignar there was not much applause. But the moment (exactly by 4.40pm) Superstar entered the auditorium with his trademark fast walk (king walk), the whole hall became electrified. All of a sudden the flash lights of the whole media people started falling on Superstar all together. It looked like a Black Diamond glittering in a flood of lights. Other stars who were seeing this simply Perumoochu vittargal. And the youth stars such as Vijay, Vikram, Ajith, Surya etc .. who were sitting immediately stood up and received Superstar by wishing him. Superstar wished them with his trademark style in return. Straightaway he went where CM and his ministers were sitting and greeted them and returned to his seat. Unlike other film related government functions only a few persons were allowed to speak in the daiz. In the space between the daiz and the chair rows in the audiotorium there were lots of wires were passing here and there in the floor. (May be they belong to video cameras and other lightings) It was not a problem for others because all were very slow in their walk. Like Tortoise. But we thalaivar fans little bit worried about Superstar and had a slight fear in corner of our minds that what would happen if Superstar, because of his speedy walk, happens to trip? But Superstar watched his step carefully and at the same time his trademark speed walk was also not reduced while he was entering the hall or climbing to the daiz. As usual the loudest applause went to Superstar in the hall at the whole event and our thalaivar was asked to deliver his speech. While calling Superstar Comperer Anu Hassan referred him as "Nirathal Karuppu and Ullathal Vellai Manidhar ivar" the whole auditorium burst into whistles and applauds. Superstar appeared before the mike. We could see `tension' prevailing among Karaivettis what would he speak and will he raise any controversy etc.etc. 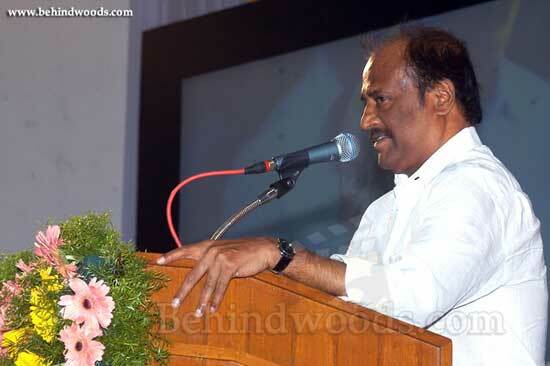 Superstar addressed everybody in the daiz and also didn't fail to address the lead actors whom were given awards. When the trademark "ENNAI VAZHA VAITHTHA DEIVANGALANA TAMIZHAGA MAKKALAE" was uttered by Superstar, it took more than a minute for the claps and whistles to settle down. 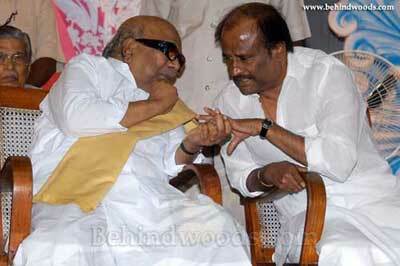 (Remember this is not a Rajini related function alone. Many fans of other actors, karia vaetis, political party workers, cine field techinicians, film institute students all were there. So, we have absolute majority among others too. Getting loudest claps and cheers in Superstar related events is a common one. Because our fans would dominant there. But creating such a response in a `mixed audience function' is a very special one. Many faces become dark after seeing the applause Superstar got. Because nobody couldn't able to generate such a response other than Superstar. Superstar started his speech with a funny remark about his clean shaven look. He said he was with ripen beard and moustache and hair till that day noon. But it was his daughters' who asked him to attend the function with clean shaven and dyed hair. Otherwise they have no other option other than to ignore the function. Superstar said laughingly I knew where this concern would have risen from. My daughters are not asking 10 grounds in Boat Club area they just want me to take off my beard. What if I remove it? So I removed my beard and dyed my hairs and moustache. Superstar's speech and spoken style was crystal clear and it was like never before. Very much improved language command and thoughts flow. Finally when he mentioned that he is wishing to raise this here but not sure it is right or not anyway as a common citizen he is rising - PIN DROP SILENCE prevailed allover the auditorium in curiosity what he is going to speak. Many ministers was seen taking kerchiefs and wiping sweat of their faces. The whole auditorium started to clap and whistle. It took few minutes to settle down. 1) Superstar asked open apology for coming late. And also said that he was told that CM will be coming by 5.00 pm and so he came late. 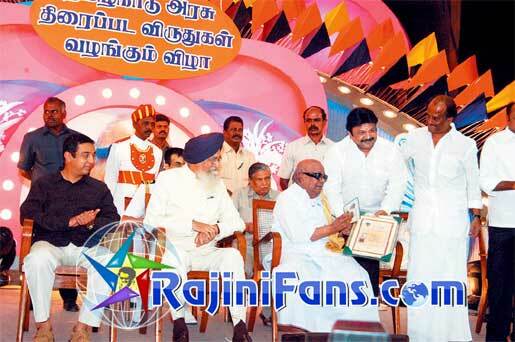 2) Everybody including Seeman and Thangar Bachchan after receiving the awards wished Superstar too while returning. Except Susi Ganesan. (May be because of tension) Anyhow we will ask him about his ignorance anywhere we meet him. He is in our hit list. 4) My friends told that it was Ajith who got heavy cheers after Superstar in the whole function. Congrats Thala!! 6) One of our friend from Triplicane came to the event dressed like Mottai Boss with a cooler in his bald head and surely he was a bigger attraction inside the auditorium. While entering the hall the girls who were at the reception fascinated by his looks and starte gazing at him. 7) Superstar mentioned that he read Mughal Emperor Aurangazeb's history and got some idea for Vettaiyan character. (So, he is reading important history books particularly that associated with Kings and Kings of Kings. Aurangazeb is one of the Emperor who was noted for his RAJA THANTHIRAM. 8) Also he mentioned about his daughters' request to shave his beard otherwise people will think that Superstar has lots of family problem so he is sporting look like this. Superstar said this in his speech. (It seems that he reads each and every magazine and newspapers. The above allegation of family problem came in gossip column of a famous bi-weekly. Superstar seems to have read that.) Gopi, is he the man who goes away from his family or normal life? No.NEVER!! 9) Superstar generated a lot of claps and whistles throughout his speech and he maintained his sense of humour and at the same time public concern. 10) Everybody received the awards fro CM by kneeling down since CM couldn't stand and give it. 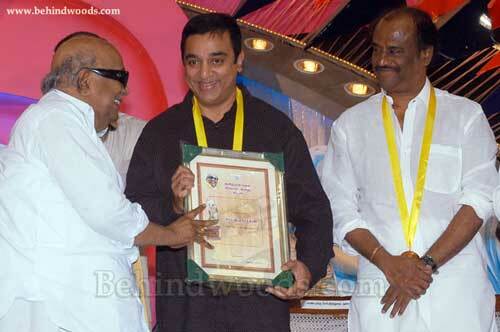 But it was only for Superstar and Kamal he stood up and gave the awards. This was indeed a bigger honour for us. 11) As usual Superstar made the headlines in all papers the next day why even North and English channels flashed Superstar's rquest to Kalaignar to settle down the Ramar Sethu issue in peaceful way. It may be telecast on coming Ayudha Pooja Holidays. We hope the applause sound for Superstar wont' be edited and downplayed.